This is my mom’s recipe. 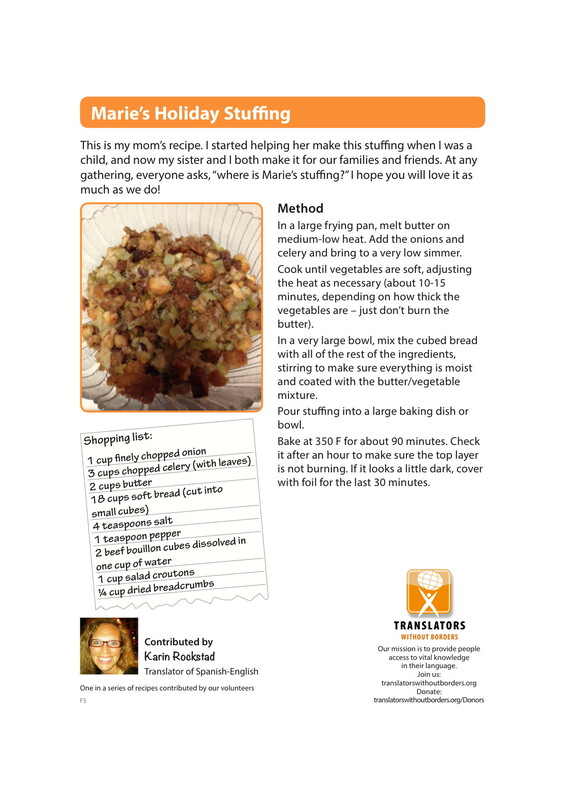 I started helping her make this stuffing when I was a child, and now my sister and I both make it for our families and friends. At any gathering, everyone asks, “where is Marie’s stuffing?” I hope you will love it as much as we do! If you enjoy this recipe, please consider a donation to TWB. In a large frying pan, melt butter on medium-low heat. Add the onions and celery and bring to a very low simmer. Cook until vegetables are soft, adjusting the heat as necessary (about 10-15 minutes, depending on how thick the vegetables are – just don’t burn the butter). In a very large bowl, mix the cubed bread with all of the rest of the ingredients, stirring to make sure everything is moist and coated with the butter/vegetable mixture. Pour stuffing into a large baking dish or bowl. Bake at 350 F for about 90 minutes. Check it after an hour to make sure the top layer is not burning. If it looks a little dark, cover with foil for the last 30 minutes.